But that mask had issues, I think it looked OK, but it was very difficult to wear, it had poor ventilation, I couldn’t wear my spectacles under it, the eye slits where very small and the hair somewhat unruly, it had a habit of flopping down making it even harder to see. I could just about do photoshoots in it, but it was too impractical to wear outside. Also, aesthetically, the jawline just looked a bit wrong. So I started work on a MKII. This was going to have better ventilation, be wearable over my glasses, better visibility, have interchangeable hair and eyes and a prettier jawline. I started with the original model and enlarged it slightly, then altered the jaw and made sure the whole in the bottom was wide enough for my specs and cut out the eyes and made minor adjustments to many areas. This is mask model version 6 or printed MkII in my slightly random internal naming system (the previous was version 5). I really ought to give them proper names though. Bringing the exported STL file into my Slicer software, Cura, I found it still just fits onto my CR-10S 3d printer’s 310mmx310mm build plate, but to print whole, with support, at even a rather rough .24mm layer height it estimated it would take 3 days 6 hours…. Nope, I can’t leave my printer running that long, the noise for one thing, I and my neighbours value our sleep. I printed my previous mask into 11 sections, but that made assembly and post processing harder. This time I cut it into 7 sections using Autodesk Meshmixer software with the face mostly being whole. I printed these out, most took 6-8 hours to print, but the face took 14! I also had to print out 8 sections in all as my printed glitched out printing one of the back pieces and I had to stop the print ¾ of the way through and try and print another ¼ piece. The glitch was eventually traced to a loose connection on the printer’s X stepper motor. All pieces where printed at .24mm layer height with support as necessary using white Prima value PLA. I know PLA isn’t ideal for Kig masks due to its brittleness and difficulty of getting a smooth finish on, but I can’t print ABS with my current setup and I’ve never tried PTEG. I might be able to print that with some mods, but I’ve heard it likes being printed slowly and its already taking too long. I’m sticking with PLA for the moment, but following rule number 1 for PLA printed items… DON’T DROP THEM! After each piece was printed I have them a rough sand down to get rid of the worst of the layer lines using high quality low grit sandpaper (around 60-120 grit). This is time consuming and rather hard work.For assembly I did it as I did MKI, styrene strips glued to the inside of one piece with Cyanoacrylate, then glue that to the 2nd with CA using the strips as guides. Then fill the seams with even more CA. Then I reinforced the inside with 5-minute epoxy. I went through about 1 and a half bottles of Loctite CA and about 2 packs of epoxy (Poundshop brand) in all. As well as having seams to hide the other problem with assembling a mask from sections is alignment. The 3d printed parts are not 100% accurate and neither is gluing them together, so error builds up and by the time you get to the last pieces you might find they don’t fit very well. That error and fit problem, plus my print that failed ¾ of the way though made the back of the mask a bit nasty, but I figured no one will see it due to the hair. After assembly its smoothing and more sanding. This time I decided NOT to use XTC-3D epoxy after the mess it made last time. Instead, following a tip on the Facebook 3d printed armour and prop group I tried wood filler. I used Ronseal brand premixed wood filler I got a local hardware shop, it was quite cheap. This worked quite well, its less messy than epoxy and lighter and stronger than masonry filler, but I don’t think it managed to fill the really fine lines and was still quite hard work to sand. Still haven’t found the perfect filler, the search goes on. After wood filler I went to spray filler primer (my favourite Holts brand), and then more sanding and filling (often using Humbrol model filler for really small defects). Then another coat of filler primer, and yet more sanding, by then I’m up to 600 grit and occasionally 1200 grit. It’s not really sanding by then, it’s more like polishing. By the time that was all done I had it glassy smooth. Well the bits of the mask that weren’t going to be covered with hair, those bits got a little less attention, because I’m lazy. Final primer coat was Halfords white primer, this is a UK automotive brand and it goes on nicely. I didn’t sand this down just yet. Mask development slowed after this for a bit, due to my day job getting in the way, experimentation and waiting for stuff to arrive. Post was edited 1 time, last by “Helenako Chan” ( Dec 30th 2018, 4:28am ). Next was the padding, I wanted to get this in early, so I could try the mask on to make sure it all fitted. It was made from 5cm soft upholstery foam (left over from the last mask) glued directly to the inside of the mask with Bostik general purpose adhesive. That stuff stick foam to PLA better than anything I’ve found. I arranged the padding so its all in the top of the mask, so it didn’t interfere with my glasses when I put it on. This made it slightly looser than I’d like, but being able to get it on with my glasses easily made up for that. Yeah it’s a bit rough in there but it does the job. If you’d paid 600+ to a Pro for a mask and it arrived like that you’d be none to happy, but as this is just for my own personal use, I’m not too worried about how it looks where other people can’t see. Next task was the eyes. I downloaded a few eyes off the net and messed around in Corel Photopaint and printed them off on matte photopaper on my rather cantankerous old Canon Inkjet 2d printer. I went with blue this time. I’m naturally blue eyed BTW so it seemed appropriate. The eyes seemed to work, but I wanted to make them a bit stronger and had to put in view ports. The eyes had a lot of black in them, which I intended to use as the view ports, but I had to cover them with something. Instead of the more commonly used mesh I decided to use Neutral Density gel. This is basically smoked film photographers use to limit the amount of light going into a camera or emitted from a light source. I bought a two stop 24cm X 24cm sheet from ebay for £1.89. Two stops means the light coming in is reduced my half, then half again, so 25% comes though. This sounds a lot but actually works well, its less than most sunglasses, but from the outside of the mask looks completely black as the inside of the mask is in total shadow. I printed out the eyes, carefully cut out the black section, cut a slightly piece of ND film to match and very carefully glue it on the back on the paper with glue stick. Hrm, not bad, but a bit flimsy. Cue much experimentation with some .5mm and.75mm PETG sheet I got from 4dmodelshop modelshop.co.uk/ (great shop if you are in London), some curved blocks I carved from balsa wood, my heat gun and a lot of cursing. Eventually I got the technique, heat a rectangle of .75mm until it starts to bend with my heatgun, them quickly press it down onto the block, one hand in a heat resistant glove (cause I only had one) and the other with a wad of kitchen paper so I didn’t get burned. Then after it cooled, trim it with scissors so its slightly bigger than the eye hole. Then take a printed eye with the T shaped black section removed and glue it to the edges of the plastic with BostiK or UHU as carefully as possible trying not to get the glue on the area of the eye that will be visible. Then stick a T shaped piece of ND film over the black section with glue stick, again trying desperately trying not to get any glue where it would show. Then cover the back paper section with clear film for strength. Does that make any sense? This took a of trial and error. There where a lot of rejects, but eventually I had a couple of pairs of eyes that didn’t look too bad, had great visibility from the inside, but with almost invisible view ports from the outside and the bonus was they caught the light like eyeballs. I was quite happy with this, apart from one thing. The plastic eyeballs wouldn’t stay put for more than an hour. I tried various tapes and even high strength neodymium magnets, but nothing was working. Either I’d have to build some sort of support mechanism or glue the eyes in. I didn’t want’ to permanently glue the eyes, I wanted to be able to change the colour and design, so I could cosplay different characters. Then I realised, I don’t have to glue the eye’s in, just the lenses. I made a couple more using the heat forming technique I explained earlier and trimmed them closely fit the eye sockets. One of the lenses had a little distortion in it that made things blurry, but I thought that wouldn’t matter so much and it would be no wear near the view port… This was a mistake. Gluing in the lenses was hard, basically the only glue I could get to work properly was epoxy and that’s messy stuff. I got them in but manage to get some glue on the lens. Hopefully it’s not very visible. Another mess. Those two round shapes near the edges of the lens are the magnets I tried earlier. I made a couple more printed paper and ND film eyes, making sure I use the film to pull in the paper into a curved shape to fit the lenses. And the secured them to the mask with a few more magnets that grabbed onto the ones I’d glued in place trapping the paper in between them. Result, interchangeable eyes that look quite good and stay in place, the magnets only have to hold some a paper and film and they can do that all day long. But that distorted section in the right lens wasn’t covered up… dam. The mask was still unpainted. I’d recently ordered a new Hadatai from DAME damekigurumi.com/Skinsuits/H001-Skinsuit and wanted the mask to match that. DAME said the suit would arrive in December, so instead of waiting I cheekily asked them if they could let me know the details of the paint they use on their masks to match, or if not, let me have a swatch of Fabric. Surprisingly they offered to sell me a spray can of the custom colour they used, as they’d been thinking about selling it to mask buyers to help them make repairs or do repaints. I said OK, that’s great sent them some money for it. A week later and no paint, I got in touch. Turns out they had problems getting a courier to deliver it to me, they couldn’t find one that would ship spray paint (if the can gets punctured it would splatter paint around everything in the immediate vicinity, so its health and safety thing). But I’ve bought spray paint off Amazon and Ebay…. ? Oh well no worries, they refunded my money and sent me a fabric swatch instead. Well at least I thought I bought airbrush colour, I didn’t look closely enough and a couple of them where regular acrylics instead, DOH! After some tests I determined an aprox 40/60 mix of Vallejo Game Air Light Flesh and Flesh paints was a reasonable match to the fabric. After giving the mask a final sand and rub down I mixed up a batch and sprayed on. The airbrush, compressor and paint worked really well and put down a very smooth and flat coat of pale pink flesh tone. I was surprised how easily it was and how well the cheap airbrush worked. Also, I was surprised how little paint it took, it worked out far cheaper than spray cans. Cleaning airbrushes after painted is a bit of PITA though. Next eyebrows and lashes. I worked these out with black cardboard, cutting up shapes and holding them against the mask, trimming and altering until I was happy. Then I transferred the final design to black styrene sheet and cut and glued that one. The styrene is a lot more robust than card. Now we are getting somewhere, just the hair to do. I wanted interchangeable hair, so I can do different characters, so I needed some sort of wig for the mask and not just glue the hair directly to it. Normal human sized wigs wouldn’t work, too small and Kig sized wigs are a bit thin on the ground though. I toyed with the idea of sewing an oversized wig cap and then trying to sew the hair to that, but that would have been difficult. Then I remembered, 3d printing! I designed a wig cap by doing a Boolean my original mask against a cube primitive in blender, so I had something that fitted the outer surface it exactly. I trimmed away the rest of the cube and made it into then shell with the solidify modifier. In theory it should sit precisely onto the mask, slotting into the ventilation holes. I printed it in 3 pieces due to print time limitations and roughly joined it together and threw some spray paint on it. It was going to be covered in hair anyway so it didn’t need to look good, all it needed to was fit, which it did. So to the actual hair, I’d decided on wavy longish blonde with twin tails, because it will go with the blue eyes and it’s a favourite look of mine (see my non kigs pics). I knew I’d need at least two conventional wigs, pony tails and maybe some extra wefts to cover it all, and all had to match. Finding everything that matched colour exactly on ebay proved impossible, but a UK Cosplay company Coscraft coscraft.co.uk/ had the goods. They sold wigs, pony tails and wefts all colour matched. I bought two long wavy wigs, two pony tails and a metre of wefts all in a light golden blonde. The ponytails and wefts where straight not wavy, but I had to make do. Wig styling not something I’m very experience at but I think it’s OK. I split the two wigs, one into crown and back, the other into the crown and half the back and the rest of the back. The rest of the back of the 2nd wig got split into two. These two halves went on the sides and a several lays of weft went on the back of the cap. This was to provide an inner layer to bulk out the wig. The back half of the first wig went over the top and back of the cap and the front section of the 2nd went over the front, with the fringe being gathered into one big anime style Bang? with extra strength styling gel. The ponytails where shortened and the ends thinned out and just clipped in. Last touch was a couple of hair bows. There you have it Mask MKII. I don’t think it look too bad. Post was edited 1 time, last by “Helenako Chan” ( Dec 29th 2018, 3:41am ). The next day I had a photoshoot with the new mask, my new Hadatai (which had arrived, but I had to make some adjustment to) and a couple of outfits. One was a new little black Goth dress I’d bought recently in Camden, the 2nd was with some PVC items I’d worn to Torture Garden a few years ago. The hair makes it so much heavier, I didn’t realise it would add so much weight. The paint is quite a good match to the suit, at least in camera. The bit of distortion in the right lens is VERY annoying. So much so I might just cut the old one out and make a new one. But I’m afraid I’d do to much damage to the mask. Visibility is OK for moving around in, but checking the camera or reading a screen is next to impossible. Perhaps I can use my reading glasses instead if I have do close in stuff. Ventilation isn’t a good as I hoped. The lenses fog up after a while. I should have left an air gap instead of sealing them in. I have some anti fog stuff I use on my glasses and snowboard goggles though, I might try that. Another option is installing a fan. The camera flash doesn’t look quite so good as natural light on the lenses. Wig cap thing stays on, but isn’t 100% secure. Ponytails could do with a bit of a wave adding to them. But overall it still looks quite cute. If I can fix the fogging and perhaps increase ventilation, I might be able to wear it out. I’ll have to try and up my tolerance to it, wearing for longer periods. Perhaps I’ll have to join a Cam session? Also I could start on a MKIII to fix the problems (and possible find new ones). Still it’s fun making stuff and solving problems. Another plus is the fact that even with buying a printer and airbrush it’s a lot cheaper doing DIY than paying for a pro maker to build you one. Nice work on the mask, Helen! 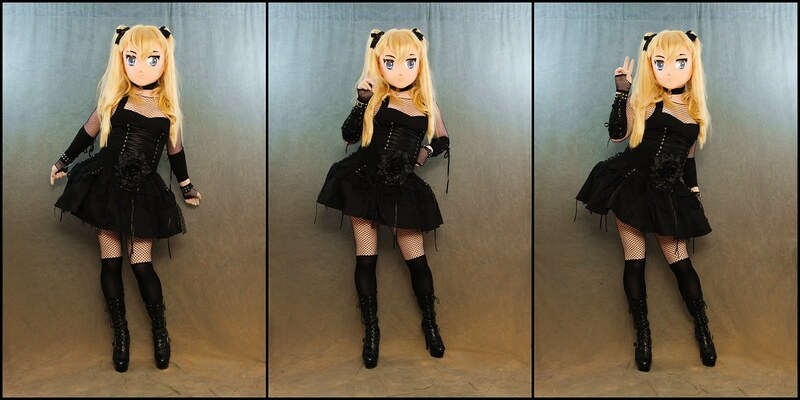 Makes me wish that I want to work on my kig too.